The latest researches indicate that the application of chemical mixed insecticides and fertilizer is the main cause of the widely spreading infections such as kidney diseases. Spreading such menaces is one of the latest hazards in particular in the Northern and North Central Provinces of Sri Lanka. Thus RAHAMA initiated a pilot project in collaboration with relevant departments to produce organic manure as an initiative to assist farming communities to find secured path of Agro based actions. 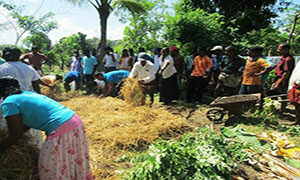 This pilot project for producing organic fertilizer is well accepted by the farming communities in the Northern region of Sri Lanka, yet, new initiatives for raising awareness of certain segments of the community is a need. 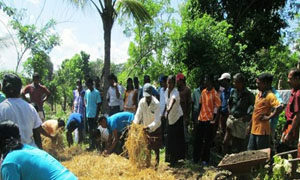 Department of Agriculture, Divisional Secretaries in respective divis ions, Medical Officers, Partner organizations of RAHAMA Sri Lanka are the central stakeholders of this program. This programme was started this year as a model project and will be replicated into other locations too, once the quality of product and once the cost factors are determined and certified. Joint effort with the intervention of stake holders are envisioned to raise awareness of the farmers’ via cooperatives on the advantages in switching into the usage of organic manure. Most of the program beneficiaries are women and this will support the economic improvement of the families and preserved environmental elements such as soil, water/ and the unpolluted air.